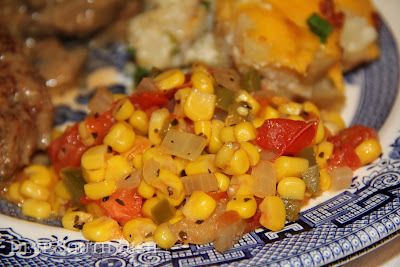 Simple maque choux, a tomatoed corn, is a very simple side dish of tomatoes and corn cooked in sauteed onion and bell pepper. I guess we're just about winding out of fresh garden tomato season, even for down here, though I did pick up a couple of large tomatoes the other day... not quite knowing what to expect from them. I used some on good ole turkey club sandwiches this past Saturday when we were finishing off the last of the vegetable beef soup I made, and was pleasantly surprised to find them so fragrant and tasty. I thought for a second there that it was still summer! So what to do with this other one? With commercial broth and some already cooked chicken you stored in the freezer, this comforting chicken and noodle dish comes together in no time. You ever go to bed feeling perfectly fine, then wake up feeling rougher than ten miles of bad road? Well, when we have a change in the weather, that's pretty much a given with me. As I've gotten a little bit older, my body and my bones certainly feel these weather changes more. I try to remember to bump up my immune system in advance with Airborne (love, love that stuff) when I know it's coming, but sometimes I just don't remember in time. 33 HUNGRY PEOPLE COMMENTED. ADD YOURS! 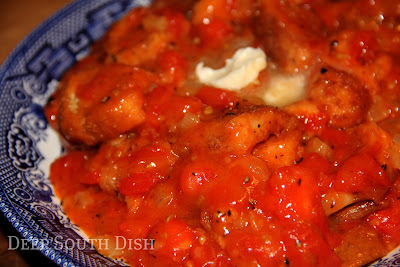 Old fashioned breaded tomatoes, or scalloped tomatoes, stewed down with a little onion, thickened with flour, lightly sweetened and tossed with toasted squares of bread, topped with cheese and baked. Great served with fried fish and mashed potatoes. Ahh sadly, it's October and the time of year where we lament the passing of summer tomatoes, because even if you have a few still producing plants in your garden, they will all soon be gone. I'm starting to see less roadside stands and more hot-house tomatoes showing up in the store, so that's a sure sign. Winter tomatoes are just not the same, sigh, but.. I'm gonna try to squeeze in a few more recipes while I can. This recipe is not going to appeal to all of you, even for those of you who love tomatoes, because of the texture issue with combining a stewed tomato with bread. 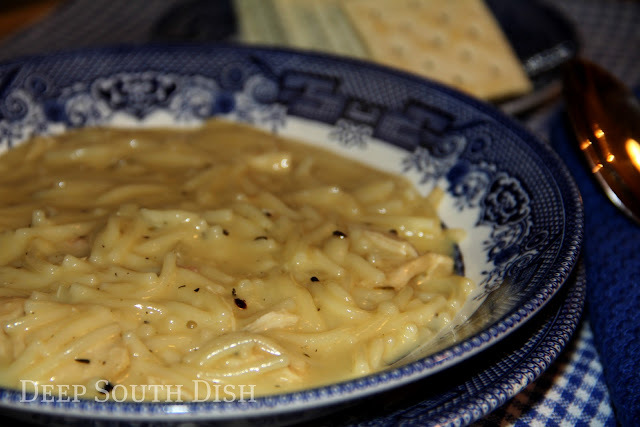 Still, I know that some of you will probably have memories of your mamas and grandmas serving up a dish of these. 36 HUNGRY PEOPLE COMMENTED. ADD YOURS! 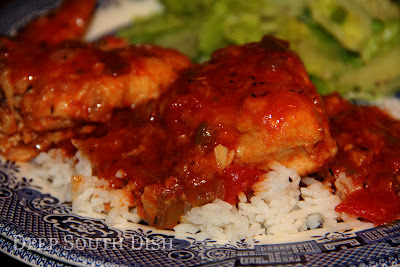 A breaded and browned whole cut up chicken is slow cooked in a spicy sauce piquante. Like Shrimp Sauce Piquant, this dish is intended to be a bit spicy, and rightly so! Although a bit different than the stovetop prep, taking inexpensive chicken, a spicy piquant sauce, and a crockpot is a good combination if you ask me. Hands down a winner and I think you will love it too! 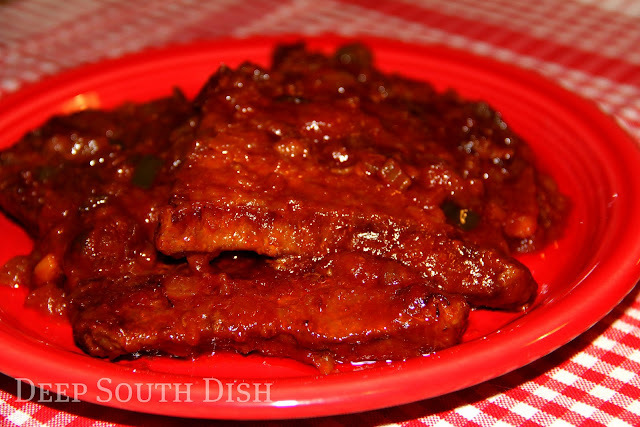 Bottom round steak, slow braised with The Trinity and an easy homemade barbecue sauce. One of my favorite inexpensive cuts of beef has always been braising steaks, and of those I love cooking a good bottom round steak. It's a tough cut of meat, but give it a braise in some liquid, low and slow, and it transforms into a wonderfully tender piece of delicious beef. Here I've slow braised it with onion, bell pepper and celery, and an easy homemade barbecue sauce - just another tasty way to prepare round steak and one that The Cajun loves. 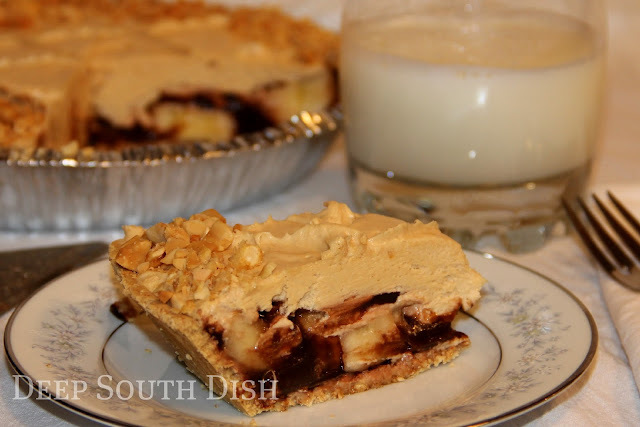 Peanut butter paired with chocolate and bananas makes a great pie for any day. Don't forget the milk! I suppose just about anybody would recognize the name Planters when associated with snack nuts. In fact, you'll pretty much always find Planters dry roasted or cocktail peanuts in our pantry. But did you know that earlier this year, Planters launched a brand new line of peanut butter, bringing it back into the peanut butter market after decades of absence? Thanks to the National Peanut Board, I recently had the opportunity to give Planter's new creamy peanut butter a try. Sliced potatoes are tossed with onion in seasoned flour, then fried in a bit of hot oil, covered and smothered with milk for a slow simmer. Simple, delicious comfort food. This is one of my favorite potato side dishes, though I've also been known to make a pot just because I wanted some too! 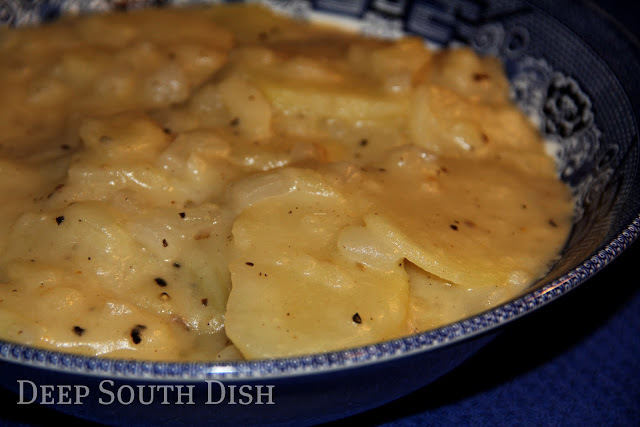 It's very simple, classic country cooking - nothing particularly extraordinary about it or anything, but potatoes prepared this way are just so delicious and comforting. Simply sliced thin, then tossed with a tiny mixture of flour, salt and pepper, first cooked in a bit of hot oil and then covered in milk to low simmer until smothered down and tender. They are as at home as a side dish with that nice Sunday pot roast, as they are with your everyday chicken, or if you're like me, as a meal all on their own.